Shocking news as the iPhone X turns out to be not some perfect celestial representation of our ideal device, but just an actual thing made on Earth. What is the biggest surprise? That this is constrained by the technology of our time and does not feature future technologies. The all-glass design is all glass? OK, you win this round, Apple. But we have our eye on you. …Apple has worked to minimize the three distinct elements (front panel, back panel and chassis) into a single item. The presumably new construction methods in the iPhone X are a step forward, but it’s a tough ask to make ‘we built it slightly differently’ to be a key selling point. A whole new construction method is reduced to just “slightly different”. Has a similar sentence ever been written about another smartphone vendor? Do other smartphone vendors even talk about their construction methods? For consumers, a phrase like ‘bezel-less’ creates an assumption that the screen will be all-encompassing when you look at the smartphone. Is it all screen? No, it is not. But it’s pretty close and it’s clear what they’re talking about: a bigger screen on a smaller device. Spence thinks average customers are going to complain about the tiny amount of bezel that’s left, as if what they care about is Apple’s marketing terms instead of what they’re going to walk out the door with. The characters in Spence’s fictional accounts really lack believable motivation. How many people walk into an Apple Store to buy an iPhone and have read the marketing copy but haven’t seen the device? Then there is the inclusion of facial recognition. What problem does this solve that wasn’t already solved by Touch ID? It certainly solves one of Apple’s problems with phone design. Yeah, how to get more screen on the front of the phone without increasing the size. That’s kind of the whole idea behind the iPhone X.
Pundits seem to think Apple should have done this without removing Touch ID. But the technology to have an under-screen fingerprint reader simply wasn’t there yet and a lot of people really hate having the fingerprint reader on the back of the phone. Apple is faulted for not having future technology and not providing pundits something else to complain about. While Face ID solves the problem of the recognising a user, don’t forget this problem was already solved with Touch ID. Except Face ID is even more specific and, therefore, more secure. Certainly the lack of Touch ID means unlocking a phone in your pocket, subtly under a table, or while being jostled in a busy commenting environment is now going to be a lot harder. Every pundit who’s all upset about Face ID uses this example and they never explain the point of having your phone unlocked while it’s still in your pants. And, OK, maybe not explaining the point is a good thing. Maybe there’s some whole weird subculture of pocket Snapchatting the Macalope isn’t aware of. He’d like to keep it that way. The rest of us, however, simply want our phones unlocked when we look at them. You know, when it’s actually useful. It remains to be seen if Face ID will unlock the iPhone X fast enough for this to be a non-issue. But the Macalope is old enough to remember when people were complaining because the Touch ID sensor on the iPhone 6s was unlocking the phone too fast, by which he means he’s older than two freakin’ years old. Environmental factors are going to come into play with lighting, clothing, eyewear and more all impacting on the efficiency. 2013: ARRGH I CAN’T UNLOCK MY PHONE WITH GLOVES ON OR WHEN MY FINGERS ARE WET. 2017: ARRGH I CAN’T UNLOCK MY PHONE WHEN I’M ROBBING A BANK AND WEARING MY NIXON MASK. 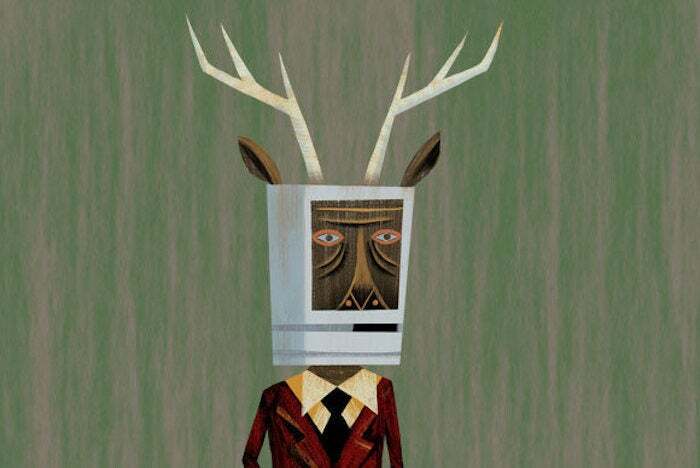 Spence, like the Macalope, isn’t a fan of the notch. But, then, the Macalope has never been a fan of larger phones and those seem to be the standard now. Sometimes history moves on without you. You don’t even have this phone. You have no idea how well it works. Before it’s released: It’ll never work! While it’s out: It works, but not as well as it should. When the replacement comes out: WHY IS APPLE REMOVING THIS MUCH-BELOVED TECHNOLOGY? !